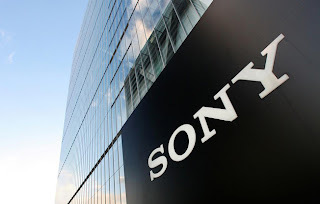 Probably not, but lets not rule it out; after all, this Fiscal Year for Sony is a fresh start, with Kazuo Hirai taking over Howard Stringer as CEO and promising a big change in Sony. But will his change be enough? Sony’s loss for last Fiscal Year was $6.4 billion dollars and as I’m sure you know they haven’t turned a profit in over 4 years. The problem for Sony, as Kazuo puts it, is that there is too much concentration on too many things. Sony literally has its paws over everything in the electronics industry. But the main problem for Sony lies in T.V’s, they are wiping profits in other divisions. All in all Sony’s TV business has lost over 10 billion dollars in 8 years, and haven’t turned any form of profit. However it’s not just the TV’s causing the problem, Sony’s Playstation division is also a source of debt. With the PlayStation division losing $2.8 billion dollars last Fiscal Year (nearly 50% of the debt). ALL hardware sales including PSP, PS2 and PS3 were also down from the numbers of the last fiscal year and Sony predicts that within this Fiscal Year combined hardware sales between the PS2 and PS3 will be even worse than last year. The one thing Sony is banking on? Handhelds. This nifty chart shows the Hardware and Software sales of the Playstation Division. 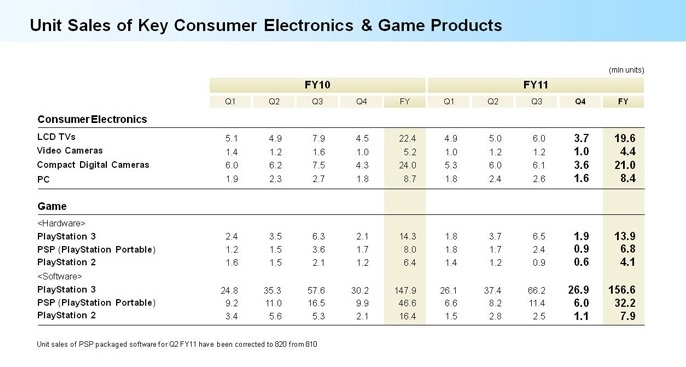 As you can see the PSP sold 6.8 million units in the FY of 2011 compared to the 8 million units in the FY of 2012. Sony’s estimates for the combined sales of the PS3 and PS2 this FY are sitting at 16 million compared to the 18 million sold last year. The handheld projection is what’s most interesting as it sits at 16 million as well. Interesting because if you look at the declining PSP Sales 8 million from FY10 > 6.8 million in FY11 you’d have to assume that in FY12 PSP sales are going to drop below 6 million, especially with Sony’s latest handheld now on the market. So with a projection of 16 million handheld sales and assuming that the PSP sales are declining each year you can assume that Sony is projecting the PS Vita to sell over 10 million units this year. At its current rate, 10 million units wouldn’t be possible. If the Playstation Vita’s sales kept continuing like they were right now it would only sell 3-4 million units by the end of the year. So how will they reach 10 million? What do Sony need to do to finally turn a profit? Let us know in the comments below!